Hello lovelies, today I have my favorite sparkly/glitzy nails for you with a sneaky peak of a Christmas nail art I have in store for you all. Christmas to me screams glitter, sparkles and pretty things. I do also love my plums, reds, silvers, golds etc but these are my favorite sparkly numbers. I have some Christmas Nail art tutorials coming up so keep your eyes peeled. Barry M - Red Glitter; A gorgeous opaque red glittery polish that gets me right in the festive mood. It is so pretty and sparkly and you literally only need one coat but if that's not enough then go over with another coat. The lasting power is brilliant, that great its a bugger to come off! Like all glitter polishes. Rimmel - Your Majesty; An opaque silver that isn't all that glittery but it shimmers like no other. You only need one coat of this too to become opaque but that's to your own preference. OPI - Happy Anniversary; This colour is my favorite I think of the glitters, it is so stunning! Would look gorgeous for a wedding or christening. This is gorgeous on its own but even more outstanding on top of neutral shade. Maybelline Brocades In Knitted Gold; Another gorgeous polish that I have been loving, this isn't that opaque alone but a couple of layers and it is but I like this on top of a normal gold shade. It is super shiny and glitzy a very girly number which would rock at a party. W7 - First Class; A gorgeous sparkly gold that would suit all ages to give your nails a sparkly elegant touch. Rimmel - Disco Ball & Miss Sporty - Sparkle touch; These two polishes are exactly the same! Sparkly particles of blue, silver and purple looks gorgeous on top of any colour base. The Snowflake nail is a sneaky preview of one of my Christmas nail tutorials. 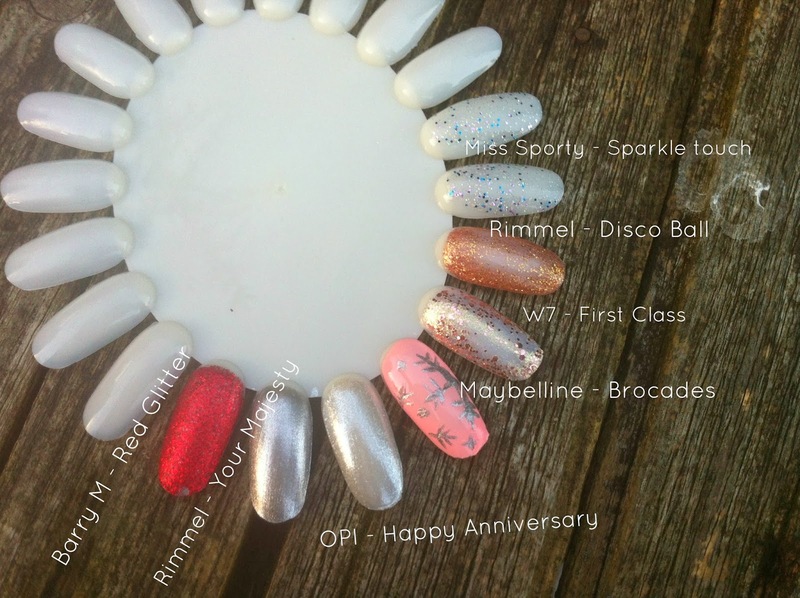 I don't just wear glittery polishes at Christmas I adore a touch of sparkles on my finger tips but just thought I would show with you some of my favorites if you was looking to sparkle and shine at a Christmas party coming up. Do you like a bit of glitter around Christmas time? What are your favorite sparkly numbers? Tuesday Takeover - Beauty By Geeks. NOTD - Maybelline Color Show Brocades.